The streets of Dhaka are running red with blood. We’re not talking little trickles of blood, either; we’re talking full-on blood flood filling the city, turning the capital of Bangladesh into a post-apocalyptic wasteland. There have been lots of horrible flooding events, like a flood of toxic sludge and street-clogging floods of frogs, but a flood of blood has to be the worst possible kind of flood I can imagine. As it turns out, the blood isn’t from some sort of The Shining elevator situation. It’s related to one of the holiest events of the Islamic calendar. The blood comes from the so-called Feast of Sacrifice, Eid al-Adha. Adherents take animals, like goats and bulls, and sacrifice them in the streets, giving the meat of the dead animals to the poor and mimicking the blood sacrifice made by Abraham (Ibrahim in the Koran) after God tested him with the order to sacrifice his son. 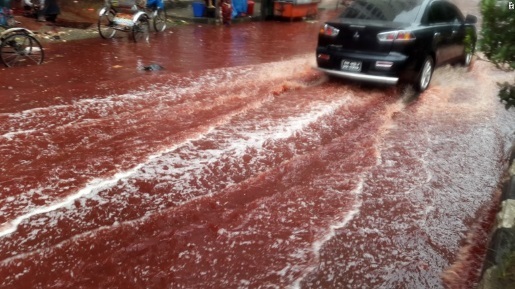 Dhaka has over 1000 designated sacrifice points, but some people clearly just took animals out into the street and started hacking, and when you combine lots of animal blood, flooding rains, and poor drainage, you end up with some pretty horrifying scenes of people wading through knee-deep ichor.